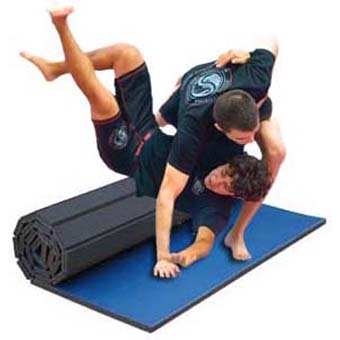 Here’s a home exercise mat great for home exercises, martial arts, wrestling, and a variety of aerobic activities. This home workout mat is made of a durable, professional-quality, vinyl-designed for years of workout use. The foam material in this exercise mat is cross-linked polyethylene. This workout mat makes home exercise easy. You can effortlessly roll out this lightweight mat and roll it up to store when you’re done. Home users can use this athletic workout and exercise mat for aerobics, wrestling, grappling, and martial arts practice. It is available in black, red, navy, and royal blue. AT 5×10 ft x 1.25 inch thick this workout mat is big enough for most people to do their basic aerobic activities. Order two mats to cover a 10×10 ft area. Vinyl tape should used to cover the seam when using more than one mat together. You will find this workout mat works very well on top of carpeting for home workout exercises such as P90X. The foam material of this workout mat will grip carpeting very well and provide a safe non-slip surface to exercise on. It is simple to install and transport which makes this product an excellent choice for aerobic and plyometric training and exercise. It is also great for all types of martial arts including BJJ, judo, and MMA. This workout mat is backed by a five-year limited warranty. Our quality-control standards are among the industry’s most stringent. This workout mat is manufactured in the USA with the best quality durable vinyl cover and foam materials. It is manufactured from the same materials that are used in our professional roll out mats. When needed, you can easily clean workout mats with common household floor cleaners with a damp mop. This 5×10 exercise mat is available with free shipping.